If you decided to replace WooCommerce Points and Rewards with YITH WooCommerce Points and Rewards, you won’t lose your users’ points history. The premium version of the plugin allows importing the points history registered by WooCommerce Points and Rewards without losing any data. Fist of all, make sure that both plugins are installed and activated. You will be able to see a specific option in YITH > Points and Rewards > Settings called Apply points from WooCommerce Points and Rewards. Click on Import points to import the points history. 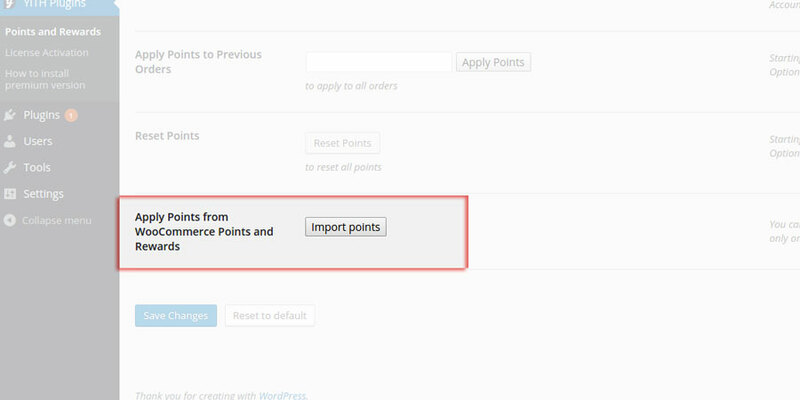 After that, you can deactivate WooCommerce Points and Rewards plugin and go on with YITH WooCommerce Points and Rewards.